Aging And Addicted: The Opioid Epidemic Effects Older Adults, Too : Shots - Health News Doctors have commonly managed the persistent pain of people over 65 with prescription opioids. But that has left some still in pain, and with a physical and emotional dependence that can ruin life. John Evard, 70, at the Las Vegas Recovery Center last July. 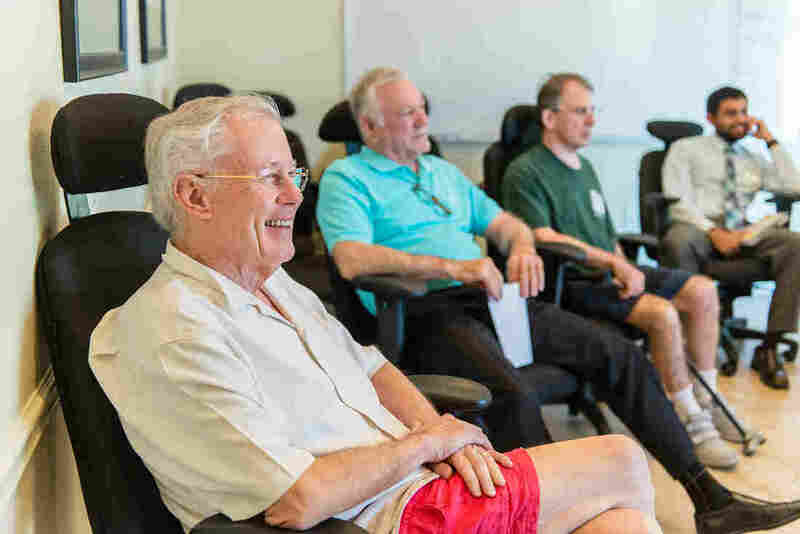 Evard, a retired tax attorney, checked into a rehabilitation program to help him quit the prescribed opioids that had left him depressed, groggy and dependent on the drugs. "Any sweats?" a nurse asks him as she adjusts his blood pressure cuff. "Last night it was really bad," he tells her, "but not since I got up." Evard, who is 70, says he woke up several times in the night, his sheets drenched with sweat. Evard says it is hard to understand, even for him, how he ended up 300 miles away from his home in Scottsdale, Ariz., at this bucolic facility in the suburbs of Las Vegas. "This is the absolute first time I ever had anything close to addiction," he says. He prefers the term "complex dependence" to describe his situation. "It was, shall we say, a big surprise when it happened to me," he says. It's perhaps no surprise, then, that some, like Evard, end up addicted. John Evard (left) participated in group therapy during his stay at the rehab center. He was prescribed increasing dosages of opioids to manage his pain, Evard says, but it didn't work, and he was unable to quit the pills on his own. "I was effectively housebound," he says. Evard spent his life working as a corporate tax attorney. He's lively and agile, with a contagious grin. A few years ago he and his wife retired to Arizona with their eyes on the golf course. But the dream didn't last long. Just months into retirement, a virus infected Evard's left ear. Overnight, he lost half his hearing and was left with chronic pain. In January, he had surgery to fix the problem. "From the surgeon's standpoint, the operation was successful," Evard recalls. "The problem was, the pain didn't go down. It went up." His doctors prescribed opioids, including Oxycontin. "They decreased the pain, particularly at first," says Evard. "As time went on, [the pills] had less and less effect, and I had to take more and more." As the doctors increased his dosage, in hopes of managing the pain, Evard's once active life fell apart. He was confused, depressed, and still in pain. "I was effectively housebound," he says. "I couldn't play golf anymore. I couldn't go to social events with my friends or my wife." He couldn't think of anything except the pills, focusing on when he'd be able to take the next one. He knew he was in trouble — despite having taken them exactly as his doctor instructed. "I was a rule-follower," he says. "And I still ended up in a mess!" 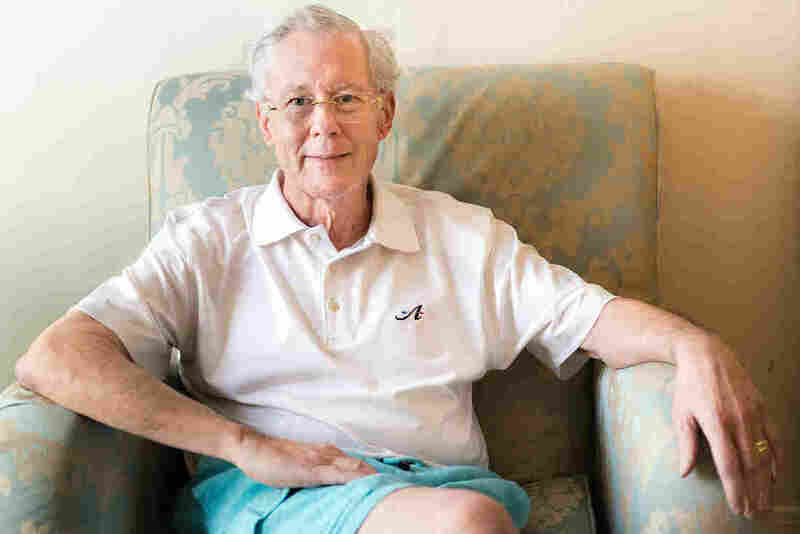 Dr. Bruce Ferrell, a geriatrician and pain specialist at the University of California, Los Angeles, served as chairman of the panel that issued the AGS guidelines. "You don't see people in this age group stealing a car to get their next dose," Ferrell told The New York Times at the time. Dr. Mel Pohl, medical director of the Las Vegas Recovery Center, calls that conclusion a "horrible misconception." "There's no factual, scientific basis for that," he says. "The drug takes over in the brain. It doesn't matter how old the brain is." The problem is that there aren't many good options to treat chronic pain as people age. Even aspirin and ibuprofen carry bleeding risks that can be serious. "We really don't use opioids necessarily as the first line of treatment, because we understand what the risks are," says Dr. Sharon Brangman, past president of the AGS. "But we also don't want to see our patients suffering needlessly if we can provide them with relief." The trick, she said, is to first try non-pharmacological options such as acupuncture, and to use the smallest effective opioid dose possible. It took John Evard about a week to get over the vomiting and flulike symptoms of detox, which can be particularly hard on older patients. He still has some of the chronic pain that first led him to seek help from a doctor, he says, but he takes Tylenol to deal with it. He's speaking out now about opioids because he doesn't want other seniors to fall into the same trap. "Don't just take the prescription because it's part of the checkout process from the hospital," he cautions. "It's your body. Take charge of it, and push for alternatives at all costs. And if you do go on, get off them as fast as you can."